This year, Canada turns 150 and this occasion brings my memory back to our first family trip to this beautiful country and the day when we went visiting Niagara falls with the kids. We had an amazing time during that long summer we spent between Montreal and Toronto, but probably because it was our very first intercontinental trip with the kids, we also made some mistakes. One of them was not scheduling enough time to visit Niagara Falls properly. 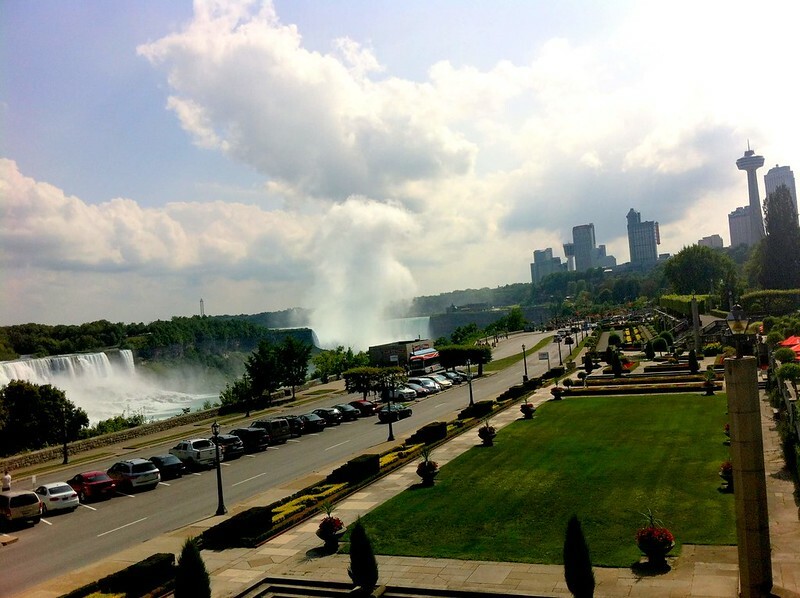 We visited Niagara falls as a day trip from Toronto and while the tour was good, it left me wanting for more. I had presumed that the viewing platforms over the falls was about all there was in Niagara Falls but as soon as we got there we realised this was far from true: there are so many things to do for kids in Niagara falls and the area has so much to offer in terms of family friendly attractions that a day doesn’t even cover half of what you can do there. Was I to go back, I would most definitely plan a full weekend there and spend a couple of nights. There are just too many activities for kids in Niagara Falls to just stay a day so my first piece of advice would be to stay one or possibly even 2 nights. If I was to go back, I would probably stay at the Marriott hotel, which is close to the falls, walking distance from pretty much anywhere and offers some family-friendly packages that include a water park (see below!). If you want to have a look at prices, you can find the best offers here (hotels combined). A corollary to the point above: to limit the amount of time spent queuing and waiting, get tickets for the cruise and the many Niagara Falls kids activities in advance. You can get some of the tickets online or you can choose a hotel that offers family packages so that the arrangements are made for you. 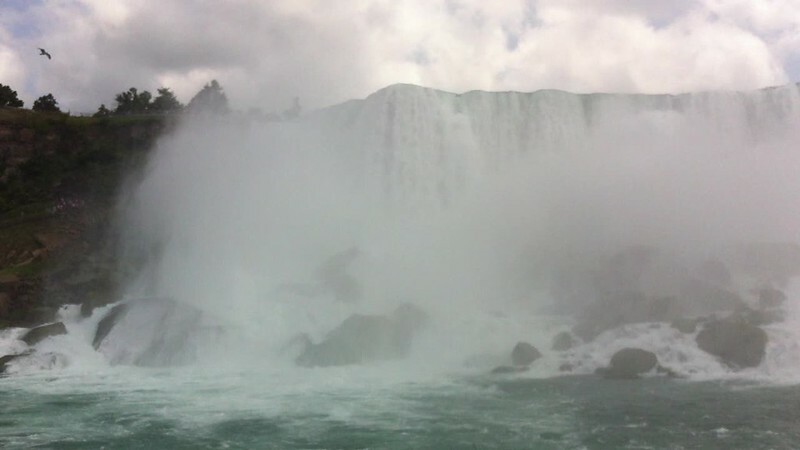 Niagara falls is full of activities and attractions for kids (the town is exceptionally built up and well served), but none matches the obvious star of the show: a close encounter with the Falls themselves. There is something truly special about getting so close to the Falls: I remember getting on the boat in a terrible mood and leaving it energised and positively giddy with excitement: the horseshoe fall is so powerful, so tall and so overwhelming I remember feeling exhilarated by it – there is no way I would miss out on that feeling again! Little Ms E got upset by the spraying water at the time, but she is a little older now and I am sure this time she would feel the excitement of the whole experience. After this, I would do the Journey Behind the Falls tour, where you take an elevator down into the rock-face and get to see the Falls from behind, before heading to the White Water Walk tour. This is where you follow a boardwalk along the river rapids: once again, this is something we missed out on last time as we hadn’t done our research properly, but we heard people talking about it and it sounds like the most amazing experience to get up close and personal with the falls. Considering how tired we got after the excitement of the falls, I think I would spend the rest of the day chilling with the kids on the nice lawns in front of the falls and have an early dinner with a view: the falls at night time, light up, must be unforgettable. On day two we would probably take it easy with a long indulgent breakfast in the hotel (always such a treat and one of my favourite things about hotel stays) and then we would see some of the attractions specifically for kids. We might head to the Fallsview Indoor Waterpark with its many swimming pools, water slides and beach huts for a cooling drink, or perhaps to the Botanical Gardens where they have a butterfly conservatory. Knowing my kid’s passion for pools and water, we would most likely head to the Fallsview Indoor Waterpark with its many swimming pools, water slides and beach huts, or the kids may want to go to the Botanical Gardens where they have a butterfly conservatory. If you follow this blog, you may know I have an almighty fear of butterflies you won’t see me there, but the kids love them and I am trying hard to not to pass this phobia on to them so I would encourage dad to take charge of the expedition. Me, I’d just make the most of my free time for a relaxing drink with a view of the fall – this way, everybody wins! More up my alley would be the Bird Kingdom too, which is home to hundreds of flying inhabitants, including a tropical habitat and a nocturnal section – I learnt about it here and I think it would be a lovely way to complement some pure play time with some contact with nature and an educational experience. For the evening, I am told I should go to Clifton Hill, where there are tonnes of restaurants, amusement arcades and even a haunted house and then face my fear of height going up Skylon Tower – the view will be worth the shaking legs! The I think we should finish the day playing a game of glow-in-the-dark miniature golf, which honestly looks like the best fun ever! What did you think of my weekend plan? Do you have any more suggestions for places we should go? Please note: this post contains affiliate links and if you make a purchase through them, we might make a small commission at no extra cost to you. This commission will go towards covering the expenses necessary to run this blog.